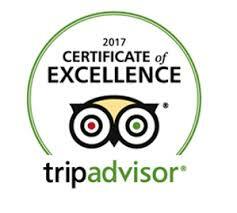 “The staff for our charter was GREAT. Made sure every passenger had a good time and caught their limit. Nick was our Captain. Patient and knowledgable of the waters and tides and wicked skills cleaning and fileting our catch. Mike (the owner) has a fantastic set up for all skill levels and makes sure you are well taken care of. Our catch was packaged and frozen ready for shipping or checked baggage. We travelled 12 hours to get home and the fish were STILL FROZEN. 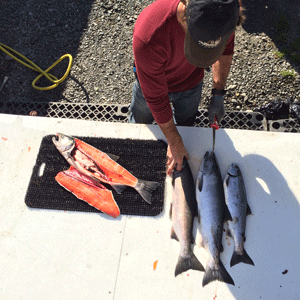 Top rate place for sure.” – Kim S.
In addition to fishing, we offer Alaska fish processing and vacuuming sealing! After your charter, our staff will clean and prepare your fish for packaging and shipping. As a result, our guests take home properly filleted cuts, processed and sealed with guaranteed freshness! Together with fishing and processing in one location, our guests can truly experience Alaska with an all inclusive experience. 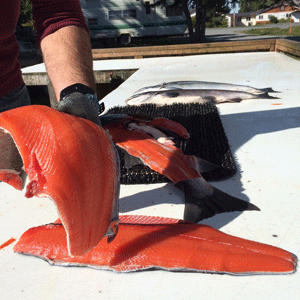 After your charter, your fish will be cleaned and filleted by your Captain. Furthermore, you then have the option to have it processed, vacuumed sealed, and shipped with our facility. Thus, pricing below reflects this process. Particularly, the most common question we receive is about shipping. Due to our high standards held by our team, we chose to partner with Fedex to ensure proper handling and care of your package. Therefore, to ensure your fish arrives promptly and frozen, you have 2 options for shipping- Overnight or 2-Day. Accordingly, package cost will be determined at the time of your processing. Generally, the cost 100% depends on weight and location in which you are sending it to. In brief, to better understand costs in advance, we recommend you research FedEx’s cost for your location. The boxes we provide are either 15lb boxes or 50lb boxes for your reference. In addition, a common question that is asked is whether or not to bring coolers. Generally, we do NOT provide coolers for clients to use after a fishing day. As a result of not providing coolers, you do have two options to package your fish. You can choose to have your fish filleted and bagged to bring back for fish processing OR you can choose to have your fish processed with us and take home same day. Also- if you choose to bring a cooler, we ask that you leave it in your car so we can occupy the most space on the boat during your trip. Afterward, you will have the opportunity to grab your cooler, while we wrap up preparation of your fish.